All work and no maintenance makes for a poor performing backhoe. 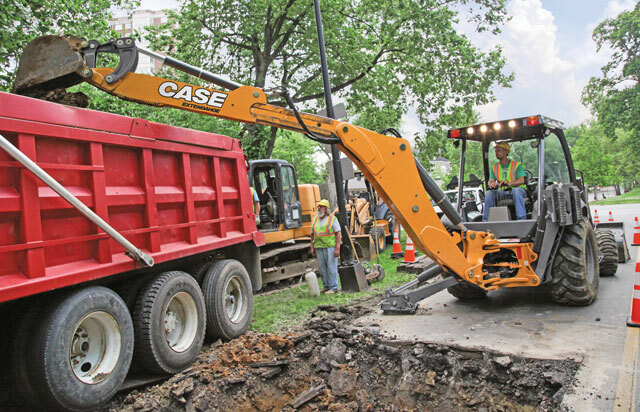 While backhoes are a staple in many large fleets where they are cared for by a full-time fleet manager, they are equally — if not more so — widespread among owner/operators and smaller businesses where the person operating the machine is also the one performing maintenance on it, hauling it, acting as site foreman/lunch gofer, etc. Even in those large fleets, where they may have “a guy” who performs all the maintenance, there are actions that operators can take in their day-to-day activities that will have a long-term effect on the health and performance of the machine. The proliferation of Tier 4 Final equipment — with greater fuel and fluid tolerances/demands — also requires attention and understanding from everyone in the machine management cycle. Rip this article out of the magazine, post it to the shop wall or make copies of it and tuck it in each crew truck. It’s a good refresher for backhoe operators, new and old, to keep that machine running at its best. Know it. Or, at least, know where to find it. Inside each owner’s manual is a detailed service interval schedule that should be followed. Old school fleet managers will lay out these intervals in a log book or on a massive whiteboard in the shop. Others will leverage the free telematics available on select backhoe models and automate alerts for required maintenance so that intervals aren’t missed. Either way, everything needed is right there in the owner’s manual. This is, arguably, the most important few minutes of the day in the life of the backhoe (or any machine, for that matter). As usual: Check the oil and hydraulic fluid levels, check tire pressure and condition (especially important given how much time backhoes spend in travel mode) and grease as needed (more on that to come). But also take a few minutes to assess in the overall condition of the machine. Look for visible damage, leaks or anything else that might be out of order or indicate something that would impede the operation of the machine. Check for cracked paint around the backhoe and loader arms where they could be susceptible to high stress. Cracked or spider-webbed paint could be an indication that the metal structure beneath is cracked and should be investigated to ensure there’s no serious damage. Inspect the condition of the buckets and/or attachments, and ensure that all are properly engaged. Check belts and auxiliary connections. Identifying possible mechanical issues with the backhoe, either at the beginning or the end of the day, will ensure that it is fixed and cared for properly before it turns into a more costly downtime event. This is especially important at the end of a shift where repairs can be identified and addressed before the start of the next day/shift so as to avoid downtime. There remains a learning curve with the new Tier 4 Final machines — but it’s not that hard or intensive to bring maintenance practices up to current standards/requirements. One of the areas affected the most is fluid. This is the “new” fluid required by today’s backhoes (greater than 74 hp), although owners of higher horsepower equipment and select on-road trucks have been using it for years. DEF is not difficult to manage or handle. Like other fluids, it likes cool and dry storage (although shelf life even at 86 degrees is still 12 months). It should be stored and dispensed in dedicated containers so as not to allow for any contamination (even minimal contamination of DEF can lead to degraded performance and eventual failure of the SCR system). Always buy DEF from a reliable source, and always use DEF that is ISO 22241 compliant. Organic Acid Technology (OAT) is an extended life coolant that provides increased protection to the engine and better performance throughout its service life. Today’s Tier 4 Final backhoes feature a clearly marked decal near the fill point that indicates the use of OAT and the brand specified by the OEM. This is also detailed in the owner’s manual. Conventional coolant cannot be mixed with OAT, and off-brand/off-spec coolant (separate from what is specified by the OEM) can diminish its extended life properties and cause compatibility issues when mixed. Today’s Tier 4 Final backhoes require a low-ash oil, CJ-4, that previously was not used in older equipment. This low-ash oil stands up to temperatures better than older formulations and is backward-compliant to older machines and trucks with diesel engines. The inverse is not true, however. Older oils cannot be used on Tier 4 Final equipment that specifies CJ-4. Always refer to the owner’s manual for oil specifications required for that machine. Greasing is one of the easiest daily maintenance activities that is also among the most overlooked. Do it! Do it. Equipment dealers have easy kits that contractors can buy, collect fluid samples, send in for testing and receive a report back within a few days. Analyzing engine oil, fuel, hydraulic fluid and coolant provides valuable insight into the condition and overall health of the engine, transmission and hydraulic systems and can be used to diagnose potential issues before they become a problem on site. In short: Don’t do it — or try to avoid it as much as possible (we know folks in northern climates like to keep the air conditioner/heat running depending on the time of year). Excessive engine idling has always been a drain on fuel and adds unnecessary wear and tear (engine hours) to a machine. As it relates to today’s Tier 4 Final engines, the days of letting machines idle for extended periods of time are over. Idling does not allow the engine exhaust to obtain the necessary heat for the emissions system components to function. This can lead to the engine de-rating and/or failure of emissions components — a situation that may require a dealer service visit. This can be avoided by not idling the engine for extended periods of time. One of the most common mistakes — and among the easiest to avoid — is the lack of greasing. It’s an easy but sometimes messy process that falls victim to “oh, it can wait another few hours” syndrome. 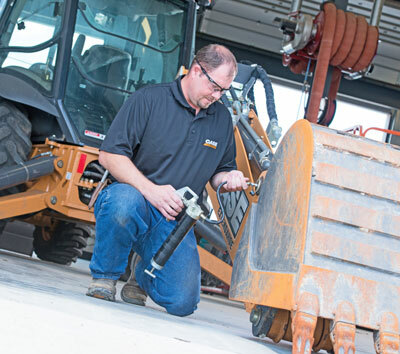 There’s a reason OEMs recommend greasing specific joints such as the bucket, loader arms and extendahoe daily — equipment that consists of large pieces of steel working in precise movement and under the stress of heavy digging, lifting and swinging. It needs that grease to ensure that everything is working properly and that no undo stress is being put on the machine. Ed Brenton is the brand marketing manager with Case Construction Equipment, and Eric Zeiser is the product manager for Case Construction Equipment.